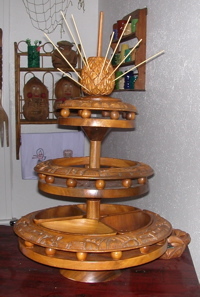 You are looking at my new three-tiered tiki snack server. Each layer rotates and the pineapple on top actually has little holes for toothpicks or satay sticks, presumably with little pineapple pieces. The bottom layer has four little wooden dishes for holding your favorite tiki snacks and there are carvings around the circumference of each layer. This is not only the score of the day, but the score of the year. Now I am excited about moving because it means that I can have a tiki housewarming party. Doesn't it make you want to have a party? YES! and it makes me want to come to Virginia to be at THE party! Ooh do take pictures of food in it when you do!